Ambassador Jim Rutledge stop for a quick photo while skiing with his daughter Bevy. Born in Port Chester, N.Y., Rutledge moved to Greenwich, Conn., when he was 9 years old. He entered college in fall 1969 but in spring when the first draft lottery was instituted, he had drawn a number which made being called up unlikely, so he decided to see the country. “Five of us drove a van around the country visiting friends,” he recalled. Ending up in Los Angeles, Rutledge drove tractor-trailers, a job he returned to off and on for 20 years. In 1972, Rutledge moved back to Connecticut and, through friends who had a house at Stratton, learned to ski. He was 21. “At first I didn’t turn a lot but I had some edging ability from having waterskied. My friends were all good and eventually I got good, but I had to work at it,” he recalled. “Sweeps usually sent me to the Glades—that’s when I first met Bill Elles (owner of First Stop Ski Shop) in Dec. 1977. We’ve been friends ever since and we wind surf and ride bikes together,” Rutledge added. From 1977 to 1982, Rutledge worked winters in Vermont and summers in Connecticut, in trucking and on a tugboat. “I quit two weeks before it sank,” he recalled with a laugh. 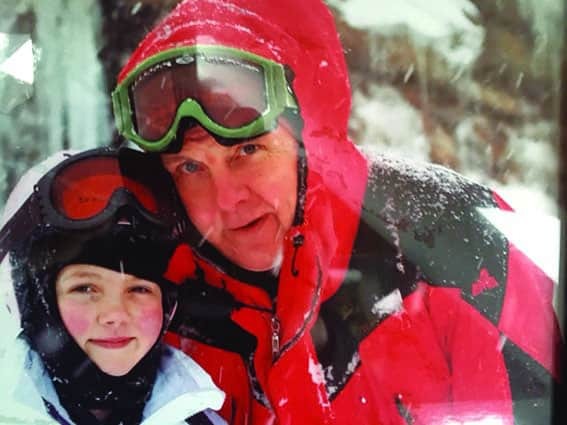 After “a few tough winters,” Rutledge ended his ski bum years by moving back to Connecticut year-round in 1983 and became a “weekend warrior.” “I went to work installing window treatments and have been doing that ever since,” he said. Having sold his share in the Vermont house in 1990, Rutledge purchased a share in a converted barn/ski house, also known as the “Canoe House,” on Rick’s Road in Plymouth Union. He ended up renting Dan Ewald’s house across the road with longtime friend Chase Morsey. “Chase was another very dedicated skier from the 1970s—he did gate keeping, race crew, ambassadoring, etcetera and is now very active in the Killington Ski Club and race program. He eventually purchased the Canoe House when I purchased Ewald’s house in 2002,” Rutledge said. Rutledge, his wife Libby Cooke, a caterer whom he married in 1997, and their daughter Bevy live in Stamford, Conn. and come up weekends and holidays to their Plymouth home. Rutledge became a Killington Ambassador in 1985 when “members of the Killington Ski Club got upset about wild skiing on the mountain” and revamped the former Killington Ambassador program. “The aim was to encourage people to ski in control, slow people down, promote courtesy, and help the ski patrol,” Rutledge noted. “If we noticed a problem, we would give a warning and punch a ticket. If the offender repeated, or someone was stopped for a flagrant action, the ticket could be pulled,” Rutledge said, noting it is still the case. He recalled serving in 1985 and 1986 under Ambassador leaders Bill Cobleigh, skiing services; Paul Guertaris, guest services; and Janis Albrecht. Recalling a meeting where Albrecht had requested the group to gather in a circle and each tell where they lived and what they did for a living, Rutledge was impressed to learn they were “engineers, scientists, etcetera . . . it was amazing to see people from all walks of life volunteering. “The Ambassadors are a group of dedicated, capable people doing a good job, making the mountain enjoyable and helping people,” he added. When Albrecht got promoted to head ski patrol, her assistant John “Grizz” Puchalski became the group’s leader. Initially, Ambassadors had to work 15 days a season (in exchange for a season pass) but it’s 21 days now, Rutledge said, noting that duties were expanded over the years. Ambassadors greet arrivals and buses, do surveys, give tours, help out on the hill with directions or calling in an accident, assist the ski patrol, and man various key places like the maps and tops of lifts at the end of day to help get people back to where they started. They also serve as hosts at special events and show visiting groups around the mountain. Rutledge usually greets guests at Bear Mt. from 8 a.m. to 10 a.m. and then his duties vary with the day and number on duty. He might help with a huckleberry (Ambassadors refer to lost kids as “huckleberries”) or come upon an accident and call it in. If a lift is down, he may go assist and tell people where to ski. He also runs “interference for the ski patrol,” noting he’s 6’4” and helps keep people away so patrollers can get a sled down safely. “Some days are busier than others so you don’t get much skiing in, but that doesn’t happen that often,” he notes of his opportunity to enjoy skiing. Among the many changes Rutledge has seen are two-way radios, cell phones, terrain parks, Telemarking, snowboarding, more lifts and trails, and color-coded wickets. The latter help Ambassadors guide folks back to where they started from as the colors indicate where a ticket was purchased. One of the most helpful changes for the Ambassadors was the renaming of some trails. “Several trails became one trail named Great Northern, a move that made it easier for us to give directions back to Ramshead,” Rutledge noted. “My scariest day was after a classic meltdown/refreeze/monsoon and Lower Downdraft was closed because it was like a skating rink. A girl fell before the rope and slid down under it all the way to Double Dipper, losing her poles and skis on the way. Her boyfriend went to pick up her equipment but he slid all the way down, too. Rutledge also attended the 1980 Winter Olympics with longtime friend Dan Ewald and counts his adventures there among his ski-life highlights, including sneaking in through the Zamboni area for the second-quarter USA v. Russia hockey game (and getting thrown out for the third period). While Rutledge admitted he has “never seen a winter like this one,” he noted: “It’s not uncommon to see rain on the lower mountain while it snows up above. The temperature drops three degrees for every 1000 feet on average,” he said. And, like the postman not failing to deliver the mail, Rutledge has shown up for Ambassador duty come rain or snow. Even when his house in Plymouth “got mangled by Hurricane Irene and staying there that winter was almost like camping out and Libby and Bevy didn’t come up—they had been traumatized by being stranded in Plymouth for five days when I had been in Connecticut”—Rutledge continued to serve as an Ambassador. Add all the friendships from his ski bum years, and Rutledge has no complaints about the ski life.